The luxurious Le Ty-Nadan Campsite is where the action’s at! 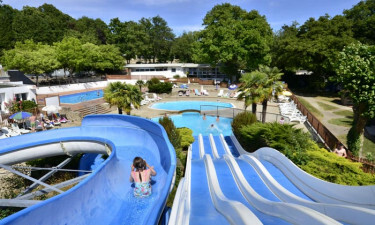 Sitting beside the lovely River Ellé and surrounded by woodland, the luxury camping site of Le Ty-Nadan is the place to come for a family holiday packed with outdoor fun and adventure. 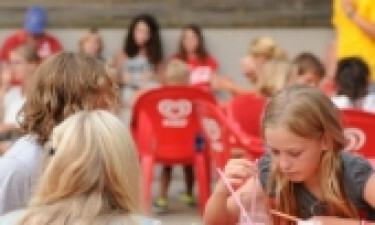 Why choose Le Ty-Nadan Campsite? The indoor heated swimming area consists of a paddling pool with a waterfall, a 60m water slide that deposits the rider in a cave and a pool especially for swimmers. There is also a big Jacuzzi and aqua fitness classes during the holiday season, not to mention the fact that the outdoor pools are also heated. 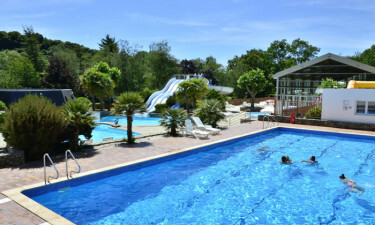 The main pool is perfect for swimming lengths, whilst the kids can ride the water slides and water chute into the plunge pool. Toddlers have their own slides too in the shallow splash pool. Spacious terrace areas with sun-loungers and parasols provide plenty of room for relaxing in the sun after a dip. For a day of culture and shopping, the historic towns of Quimper, Quimperlé and Concarneau are all conveniently close by. Best explored by foot, wander the ancient cobbled streets and be sure to try the seafood at one of the many fine restaurants, washed down with a chilled bottle of Muscadet. If visiting in August, the annual festival in Pont-Aven, which celebrates Breton culture, should not be missed. 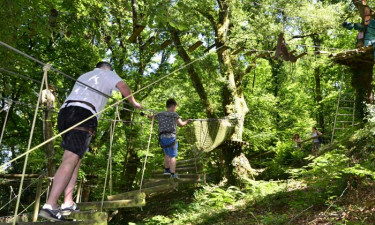 The Le Ty-Nadan tree-top adventure park boasts the longest zip wire in Brittany. What other park offers kids paintballing and electric quad biking? Young children will adore the Shetland ponies on the park's ranch, whilst guided trips by horseback through the forest and valley are available to older children and adults. Other ways to explore the surrounding area are by guided mountain bike tour or all-terrain Segway. For adventure on water there are kayak and canoe lessons, plus river trips down the Ellé in two-seater boats accompanied by an instructor. In high season, discover the Breton coast on a sea-kayaking trip. Fishing and archery are also offered, along with tennis, badminton, football, basketball and volleyball. Children too young for the adventure park have 2 play areas with swings, slides and an inflatable castle. The Ty Mad Restaurant offers a variety of national and international dishes, with al fresco dining on the terrace. There is also a bar with poolside terrace and a takeaway service. The grocery shop caters to all your immediate luxury camping needs, including fresh produce, sun cream and newspapers. The nearest town of Arzano is 3km away should additional items be required.